A proud Bud Hurlbut in front of his new Calico Mine Ride, 1960. 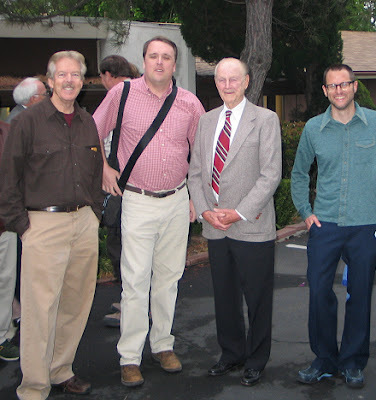 Buena Park’s Wendell "Bud" Hurlbut (1918-2011) was an entrepreneur, designer, and unsung giant of the amusement park business. 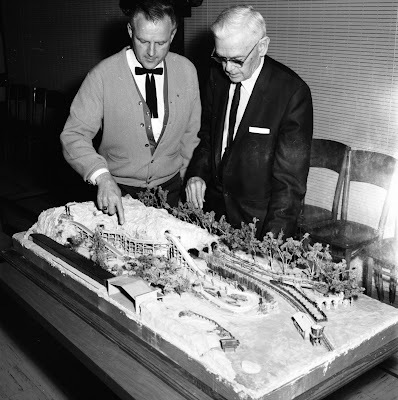 He introduced ideas that became industry standard, he restored vintage attractions, he created Riverside’s Castle Park, and he crafted beautiful miniature trains. Only Hurlbut’s modesty prevented him from being as famous as Disney’s Imagineers. 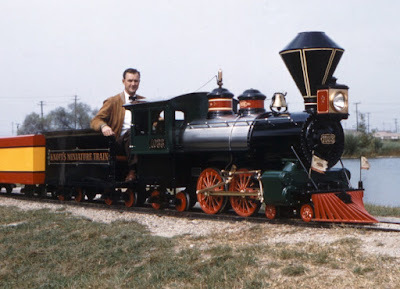 Locally, he is best remembered for the many rides he designed, built and operated for Knott’s Berry Farm, including the Calico Mine Ride and the Timber Mountain Log Ride. 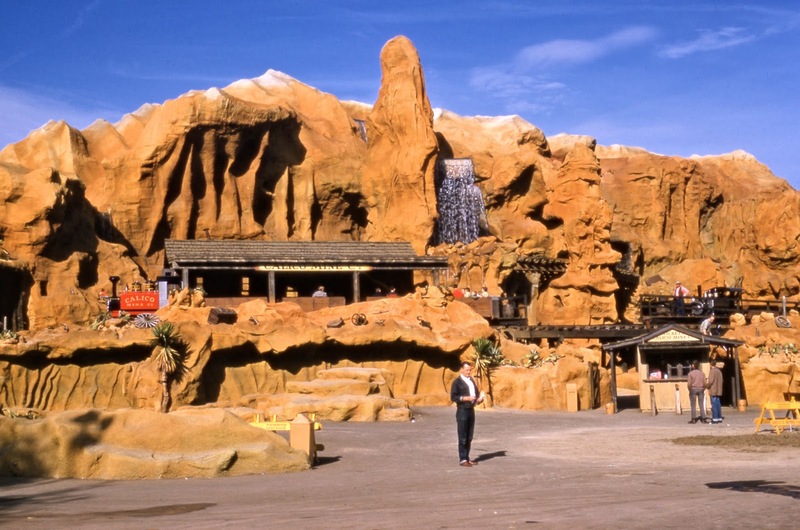 Such attractions were foundational to the engineering, business operation, and artistic design of the modern theme park. Walt Disney himself borrowed ideas from his friend Bud, as did later generations of Disney theme park designers. The Orange County Archives’ new exhibit, “Bud Hurlbut: Master of Amusement” is now open in the first floor lobby of the Old Orange County Courthouse and continues inside the Archive’s office in room 108. Photos, drawings, models and artifacts help tell the story of Hurlbut’s colorful career and mark what would have been his centennial year. The Hurlbut Collection is just one of countless collections held by the Archives detailing the history of Orange County. This particular collection includes Hurlbut’s diaries, home movies, photos, business records, and much more. Bud Hurlbut with one of his miniature trains at Knott's Lagoon, circa 1960. The exhibit will be open to the public from 8:00 a.m. to 4:30 p.m., Monday through Friday (except on holidays) at the Old Courthouse at 211 W. Santa Ana Blvd, in Santa Ana, California. The exhibit will also be open from 10am to 3pm on the following Saturdays: Aug. 18, Sept. 22, Oct. 20, Nov. 17, and Dec. 15. It will run through at least the end of 2018. Tony Baxter of Imagineering, me, Bud Hurlbut,and artist Kevin Kidney in 2007. My personal thanks to Steve Oftelie, who spraymounted more photos and text panels for this project than any human being should ever have to spraymount. Thanks to the Old Courthouse Museum for giving us the exhibit space. Also thanks to Ken Stack of Stack's Liberty Ranch for loaning us two of the many miniature carousel horses that once graced Bud's desk as well as a framed blueprint of the Calico Mine Train engines. Thanks also to Adam England of the Muckenthaler Cultural Center for loaning me a (fake) box of dynamite. You'd be amazed how animated the security folks in a government building get when you stroll in with a wooden crate marked, "Danger! Explosives!"